Belle and Sebastian are one of those bands that came out of the Scottish art movement of the late 80’s, early 90’s that are seemingly content with making music that works as a piece of art and less enamoured with the need to be commercially successful. Maybe this is because they tried to become more radio friendly when moving to a more major label in the mid 90’s, pushed onto the ‘Britpop’ band wagon, and perhaps losing sight of why they do what they do. Certainly the critical reception afforded to albums such as ‘Fold Your Hands Child, You Walk Like A Peasant’ has led to a return to less collaborative song writing, with founder member, Stuart Murdoch, taking the lead. 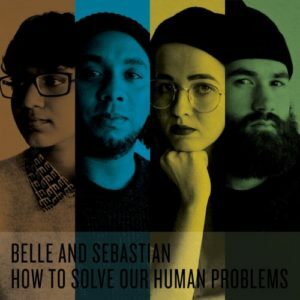 The band have now released, as a whole, 3 EP’s of material as the new album, ‘How To Solve Our Human Problems,’ a title shared with a text on Buddhism by writer Kelsang Gyatso. As the author points out, ‘humans universally seek happiness it consistently eludes them, and though they seek to avoid suffering it falls upon them like rain,’ a theme which this album covers as we find Murdoch and co-writer Sarah Martin looking back over the years of Belle and Sebastian, often with a critical or perhaps perspective eye of their career. What Belle and Sebastian have always created are albums of great musicality, with gentle nods to their influences whether that be a whimisical lyric reminiscent of Noel Coward or the more obvious jangling guitar sound of Johnny Marr. But all the while taking the music in their own idiosyncratic direction. I for one feel that their music, as championed as it once was by the likes of John Peel, fits perfectly within the scope of British eccentricity, with other contemporary acts as The Divine Comedy or The Cocteau Twins. And whilst this album maybe a tad too long at just over an hour and 15 tracks, it is still a lovely listen.